At our last tea party I had the pleasure of unveiling the cover of my Revolutionary War novel. The Scarlet Coat will be the first book of my Hearts at War series that Pelican Book Group/White Rose Publishing will release. Today, I want to take you to where it all begins, a horrific battle that plays a role in each book in the series. In August of 1777, one year and one month after the Declaration of Independence was signed, the British decided to use the Mohawk Valley as a spike into the heart of New England. Barry St. Leger was promoted to Brigadier General for the campaign and took with him eight hundred British, German, Loyalist, and Canadian troops, and almost one thousand allied Iroquois. 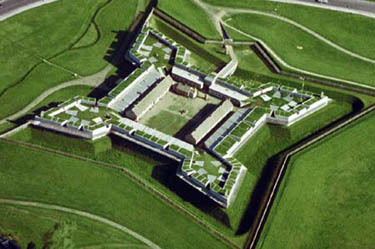 One of their first stops was Fort Stanwix (for a time renamed Fort Schuyler by the Continental forces, and near present day Rome, New York). To read more come on over to Colonial Quills!